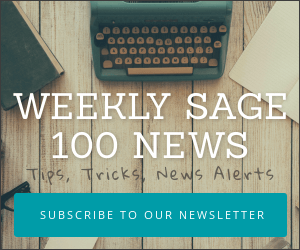 Changing a Sage 100 menu used to be – well – impossible. At least that’s what I thought until half an hour ago when super consultant Dawn Anastasi of CG Consulting threw this little tip out. 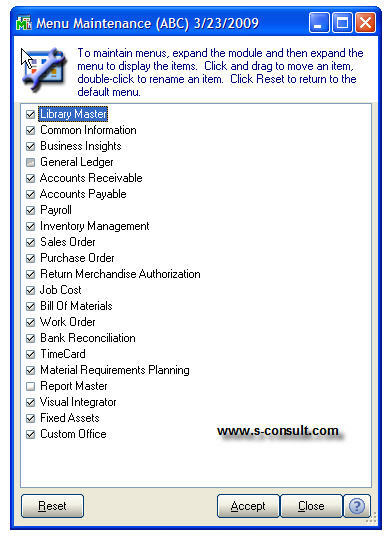 To change your menus (hide, re-order, rename) in Sage MAS 90 or MAS 200 version 4.x+ use the hidden SY_MENU_UI utility. 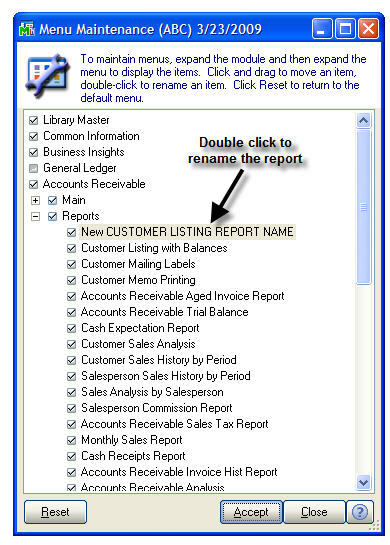 This works for any menu – including those pesky Custom Report menus that have a nasty tendency of dropping your reports in a random order. The steps to change your MAS 90 or MAS 200 menu are so simple — once you know Dawn’s secret. It relies upon being able to access the File – Run menu from within MAS (if you’re not able to do this you probably need to verify security rights and make sure you have access to this menu choice). First start up MAS 90 or MAS 200. Select the File menu and then the Run option. From the dialog box that appears, type in SY_MENU_UI and click OK.
You’ll be presented with the following dialog box. Once you’ve found the spot where you want to the new item to reside – simply drop. 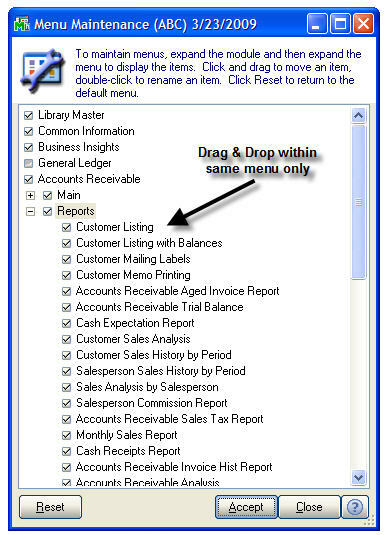 If you double click on a menu selection you’ll have the ability to rename the item as illustrated below. You must have security rights to the File – Run menu in order to have been allowed access to the utility (this is set up in Library Master – Main – Role Maintenance).